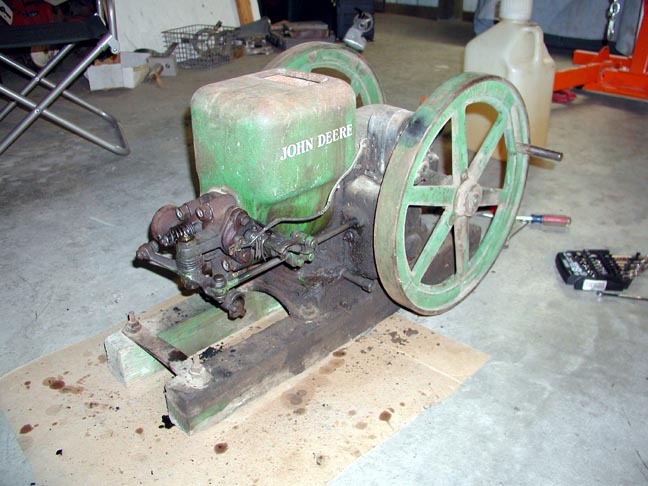 Here is a John Deere model "E" 1-1/2 horsepower single cylinder stationary engine, s/n 352751, that I am working on for a friend. 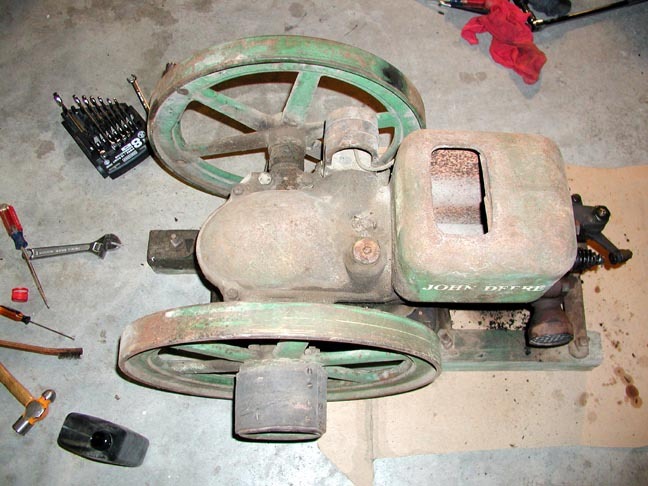 The serial number dates it as a 1941 model, #317 out of 2465 manufactured that year. 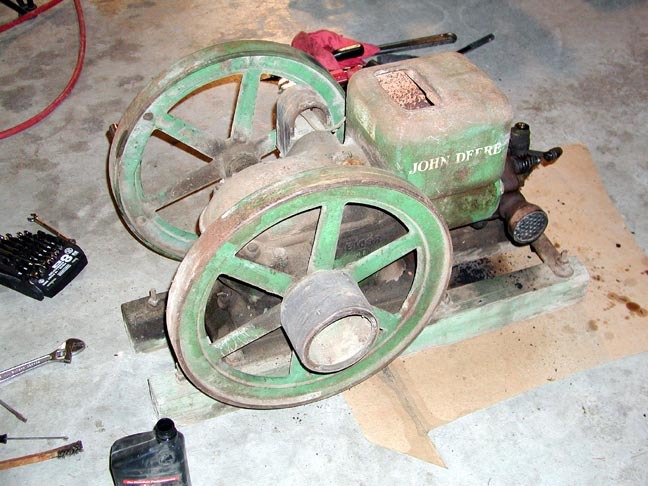 In it's day it was used in and around houses to power things like a water pump, wheat mill, and a small generator. 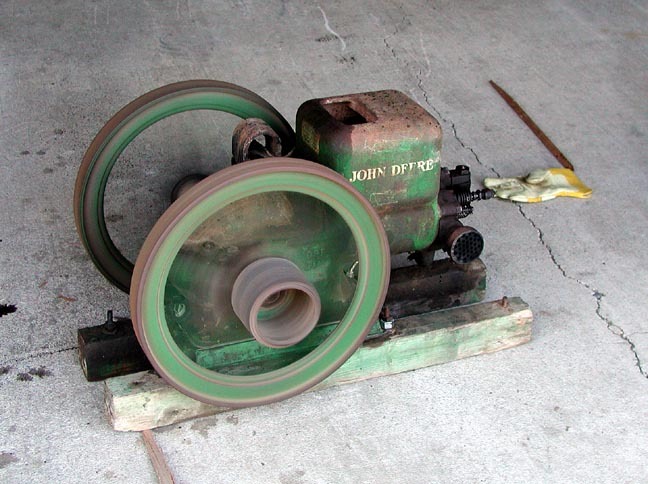 This photo shows the flywheel and the small inset handle that folds out for crank starting. The top of the water cooling tank as well as the cylinder head are visible here. 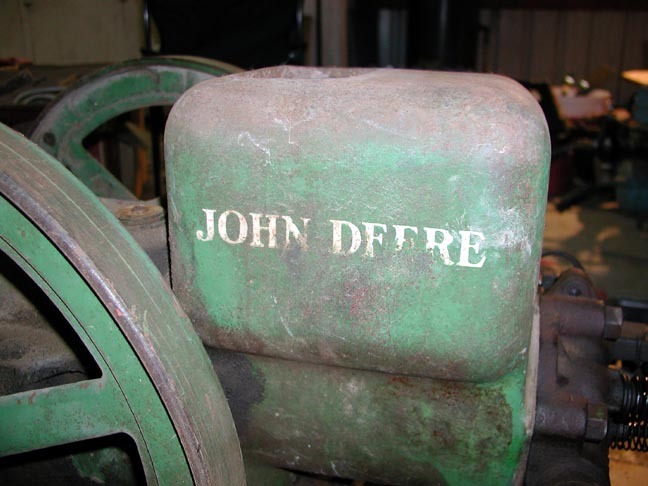 These engines, like many of the old stationary ones, used evaporative cooling. Under a heavy load, the water in the hopper will actually boil, carrying away head. The hopper has to be checked occasionally. While running with no load, the engine barely get's warm to the touch even after fifteen minutes of running. 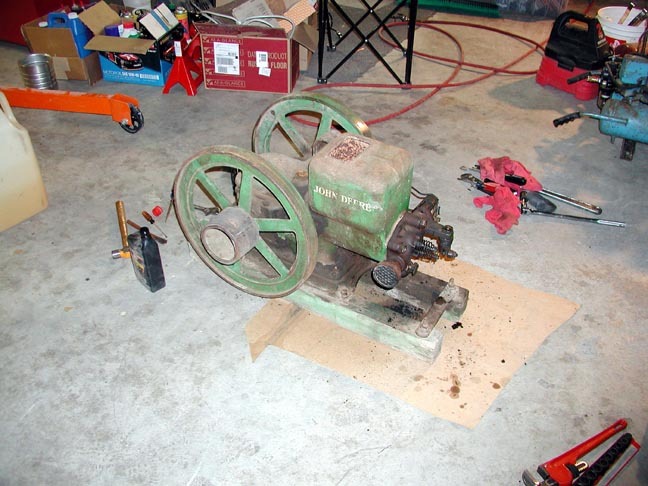 Another picture showing the engine. 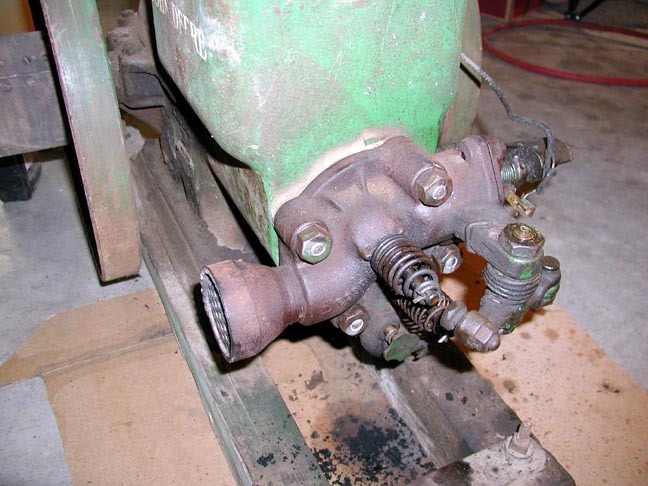 Picture of the water hopper and enclosed crankcase. 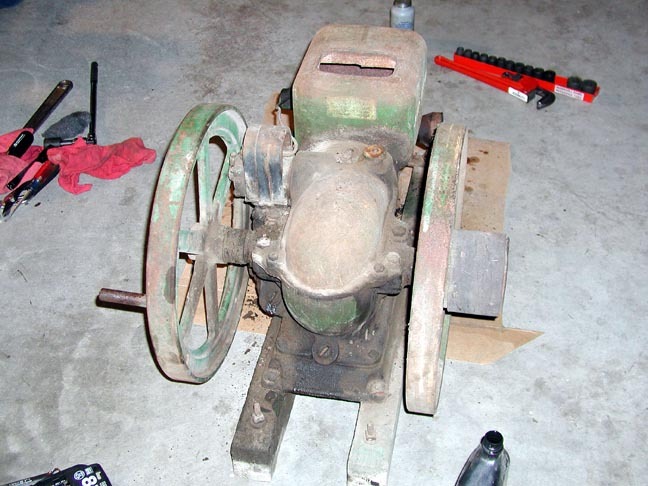 Many small stationary engines had the crank shaft and rod exposed. I'm not sure if this small belt pulley is origional or not. If you look closely, you can see the small screw-in cap for the fuel tank between the two flywheels, under the crank cover. 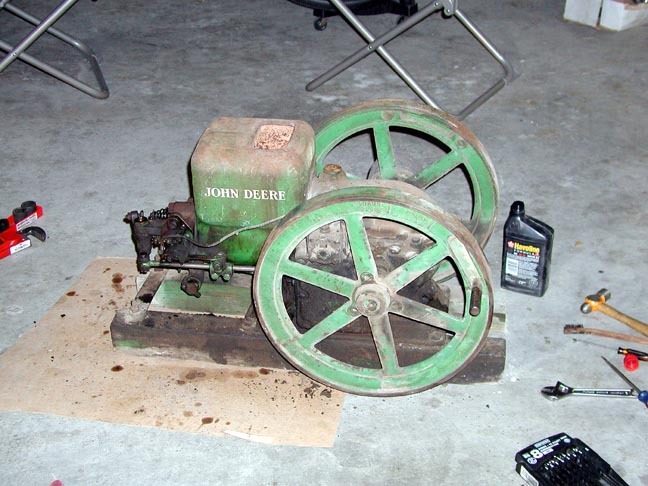 Yep, it's really a John Deere, an eighty year old one mind you. 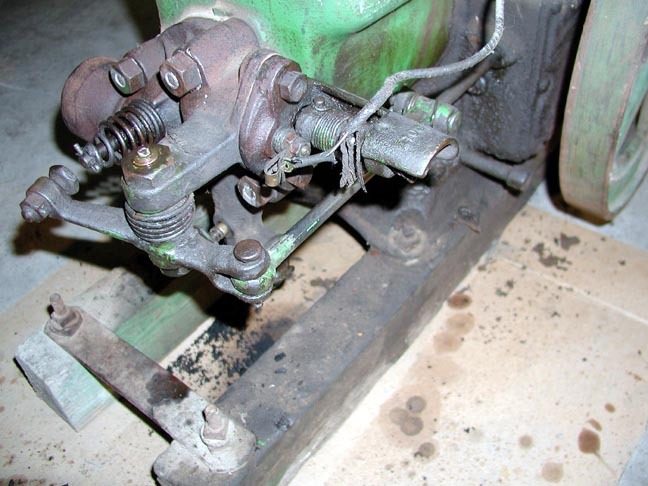 Here you can see the ignition trip setup as well as the exhaust valve rocker arm. 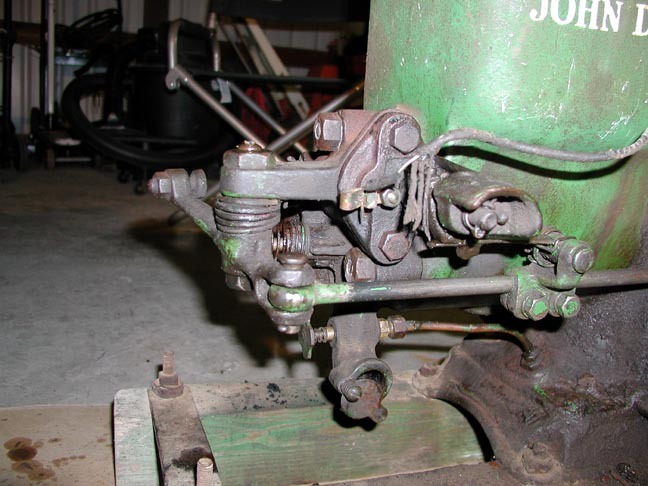 The long rod shown does double duty running the exhaust valve rocker arm as well as the ignition trip. The "spark plug" is actually a set of points inside the cylinder head that are mechanically opened to create a spark. Another picture of the cylinder head. Here you can see the two valves. The intake valve has a very light spring and opens via vacuum on the intake stroke. 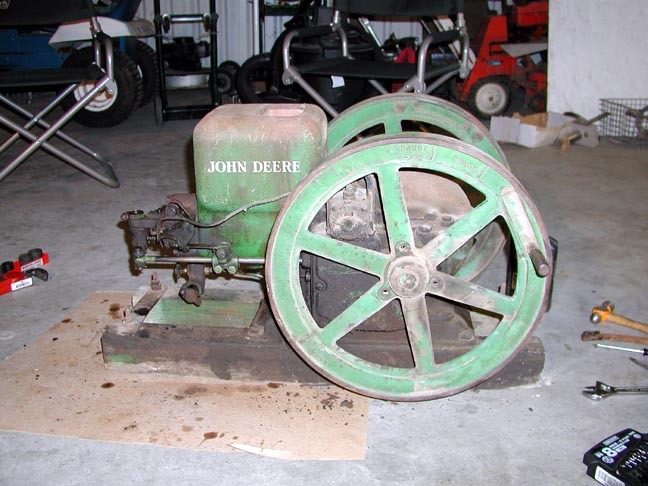 It doesn't use a rocker arm to actuate. The exhaust valve is operated by a rocker arm. 7/6/2002: After fabricating a new oil pan and troweling in a very thin coat of JB-Weld to seal the fuel pan, she fired right up! Matter of fact, she started easier than I was expecting, and got a nice rap on the end of my thumb while starting. Boy did that smart. Here's a picture of the engine "purring" along in my shop. I made a couple MPEG movies of the engine running. The files are approximately 3MB in size, so the downloading may take some time.